CDC used data from population-based birth defects surveillance programs to assess the prevalence of birth defects during 2013–2014 that met the surveillance case definition for birth defects potentially related to Zika virus infection, before introduction of Zika virus into the United States. 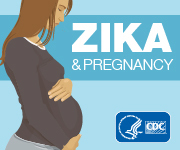 After introduction of Zika virus, the proportion of infants and fetuses with birth defects born to mothers with laboratory evidence of possible Zika infection reported by the US Zika Pregnancy Registry during January 15–September 22, 2016, was approximately 20 times higher than the prevalence of potentially Zika-related birth defects among pregnancies during the pre-Zika years. New data reported by the Centers for Disease Control and Prevention (CDC) suggest that the incubation period for Zika virus—or the time between infection and showing symptoms—is estimated at 3-14 days. Until this point, the incubation period has not been well-defined and was previously established based on incubation period of similar arboviral diseases. CDC used data from 197 US travelers to areas with Zika, were likely infected by mosquito bite and who had signs and symptoms of Zika following their visits to estimate the incubation period. CDC evaluated blood donation screening data collected by two of Puerto Rico’s largest blood centers and estimates 469,321 people in Puerto Rico, approximately 12.9% of the population, were infected with Zika from April-August 2016. Results from blood donation screening during outbreaks can add to what is known about Zika through routine clinical and surveillance data and improve targeting of public health prevention and response efforts. CDC is collaborating with public health and regulatory officials in several states, and the U.S. Food and Drug Administration (FDA) to investigate a multistate outbreak of Listeria monocytogenes infections (listeriosis). Six people infected with the outbreak strain ofListeria have been reported from four states since September 1, 2016. A list of states and the number of cases in each can be found on the Case Count Map page. Whole genome sequencing performed on clinical isolates from all six ill people shows that the isolates are closely related genetically. This close genetic relationship provides additional evidence that people in this outbreak became ill from a common source. CDC is collaborating with public health and regulatory officials in several states and the U.S. Food and Drug Administration (FDA) to investigate a multistate outbreak of Shiga toxin-producing Escherichia coli O157:H7 (STEC O157:H7) infections. Epidemiologic evidence available at this time indicates that I.M. Healthy brand SoyNut Butter is a likely source of this outbreak. Sixteen people infected with the outbreak strain of STEC O157:H7 have been reported from nine states. A list of the states and the number of cases in each can be found on the Case Count Map page.SoyNut Butter is a nut-free substitute for peanut butter.